A case with the Ketonix® Link logotype. Screws to mount the Raspberry PI Zero W board. A heat sink for the Raspberry® PI Zero W processor to keep it cool and extend lifetime. A Ketonix® power plug module with USB port 5V 2A (110-240V). International version with different adaptors for EU, AU, UK, US, KC. Ketonix® USB cable to micro USB, to connect a Ketonix® USB device. 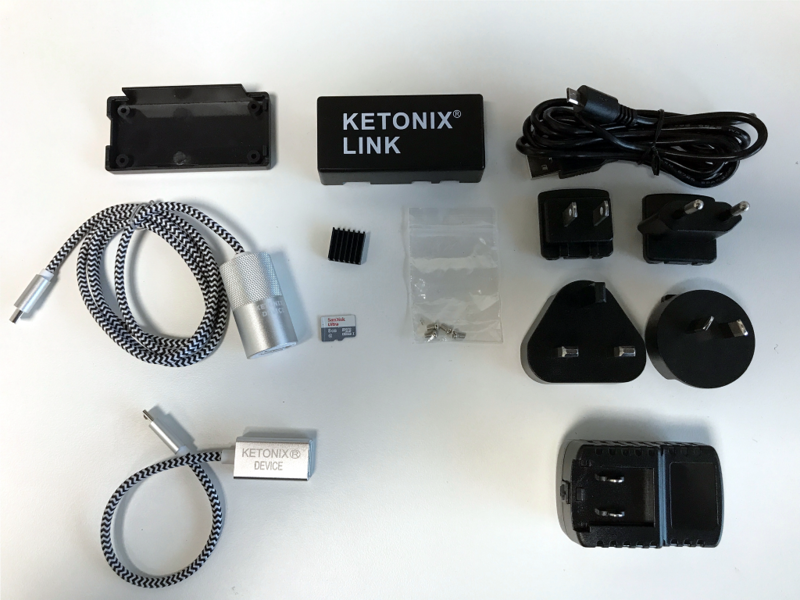 Ketonix® USB A to micro USB, to connect a Ketonix® 2015 Blue/Red device. Micro SD memory card with preloaded software. The Raspberry® PI Zero W board is not included. Click on the link below to se where you can order a card. The cost is about $15. Ketonix® power plug, Ketonix® Link case, Ketonix@ USB to micro USB cable, Ketonix@ USB to micro USB, heat sink, Micro SD memory card.